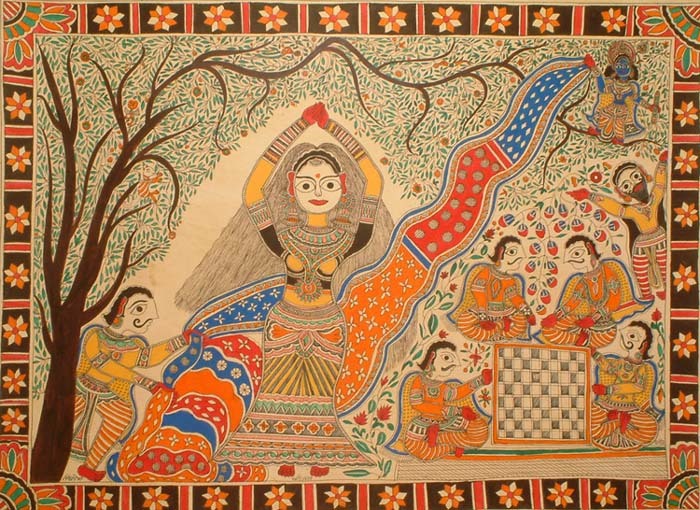 One of the central and much discussed events of the Mahabharata involves the sari – the loss of Draupadi in a game of dice and her disrobing in the royal assembly. Draupadi is in seclusion, her single garment stained with menstrual blood, before being dragged out into the assembly by the second of the Kauravas, Dushasana. The episode in itself recurs over time in India’s art, film [X] [X] and literature. Also [X] [X] The early versions of Mahabhrata, while clear that Draupadi is humiliated in court and has none to defend her, are not clear on the divine intervention of Krishna or whether a disrobing took place [X] [X]. However, the tale as presently told in India and the version that is best known has Draupadi’s sari endlessly unfolding due to Krishna so she is never publicly disrobed. This particular episode is also frequently retold in Indonesia and is the subject of a recent movie as well as illustrations. In Mahasweta Devi’s Breast Stories, the eponymous heroine of Draupadi, a tribal woman and a rebel, faces up to her abusers and remains “publicly naked at her own insistence”. Adorned with golden ornaments, and arrayed in yellow silk, Sita appeared in the air like a flash of lightning. The divine raiment given to her by the holy Anasuya, with the ornament and the necklace, shone with peculiar radiance…and she threw out her veil in like manner. Ravana flies off with Sita, who from midair lets fall her wreath of flowers, her golden silk shawl, and her lovely ornaments — the last retrieved by five monkeys on a mountain peak. 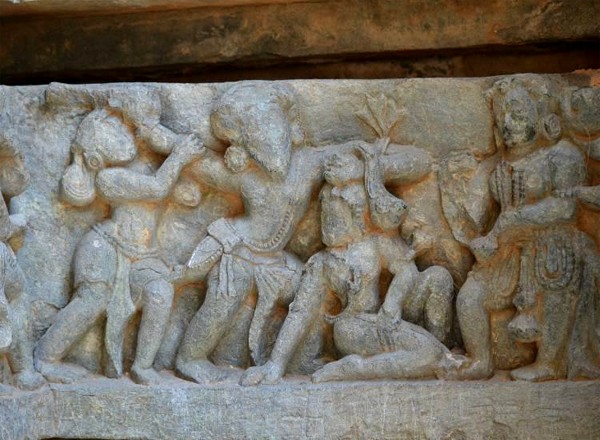 The central event of the Ramayana is the abduction of Sita by Ravana, his subsequent fight with Jatayu, followed by Sita’s captivity in Lanka. Most texts mention Sita wearing golden silk (though this is the period of exile and Sita is commonly portrayed in simpler clothes, also pic 1) when abducted by Ravana. In all versions she rips a portion of the cloth, ties her ornaments in it and throws it to the ground. 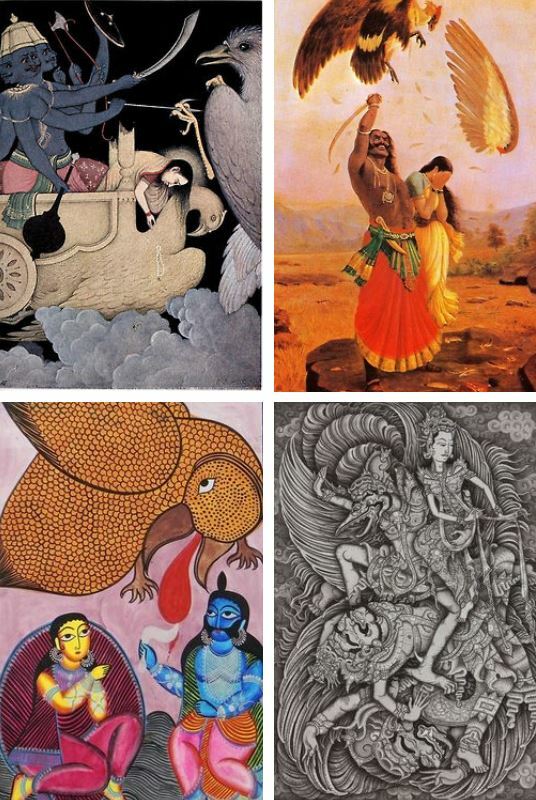 A number of paintings depict the fight between Ravana and Jatayu and sometimes detail the throwing of the garment and jewels. 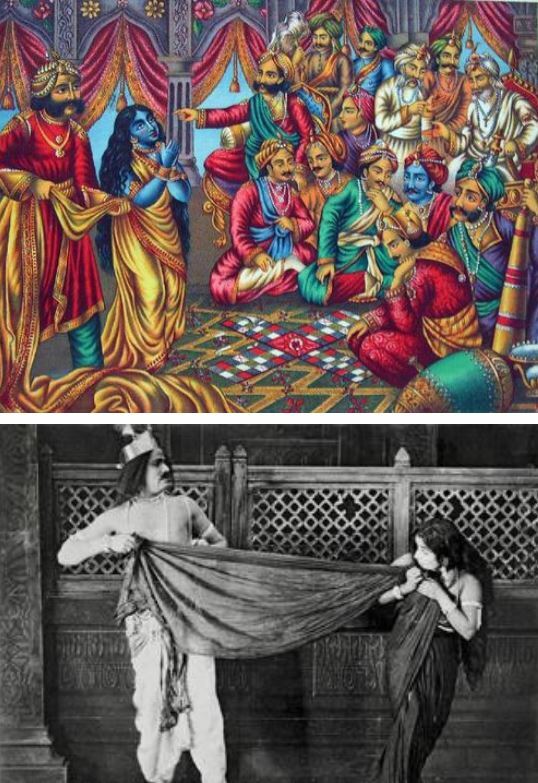 Pic 2 by Raja Ravi Varma, Pic 3 Kalighat, Pic 4 a wayang illustration. This entry was posted in Ancient India, Asia, Cinema, Costume, Culture, Epics, Hinduism, History, Indian Dress, Women and tagged ancient india, Draupadi, draupadi vastraharan, epics, garment, Indonesia, Jatayu, mahabharata, ramayana, Ravana, Sita. Bookmark the permalink.